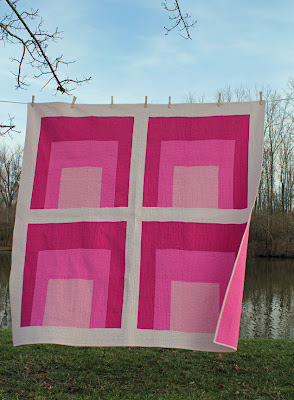 The Anni quilt is my entry for the Modern Quilt Guild's Project Modern: Challenge 2--Monochromatic. 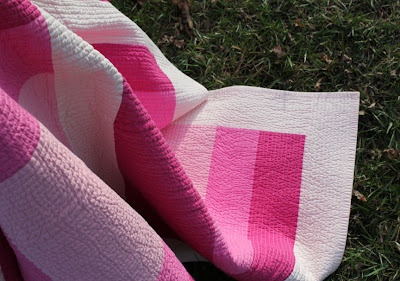 It's made out of four shades of pink solid cotton, and the design was inspired by the Modernist artist Josef Albers' series of works titled Homage to the Square. His wife Anni was a fibers artist who worked as a weaver and also designed textiles. Anni believed that fabrics should be considered as an art form in and of themselves, in both their functional use day to day, but also in their use as hanging works of art. So, I felt it was fitting to name my quilt after her. I sketched out this quilt design a few months ago, after browsing through some works by Albers. I thought his square paintings would relate nicely to quilt blocks. In my design I decided to shift the layout of the squares. 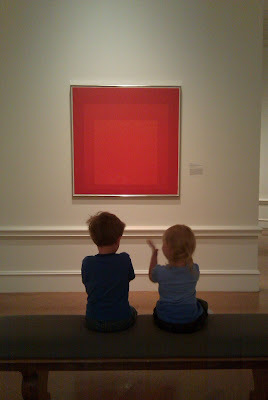 I placed the smallest square directly on the base of the larger square, instead of having the square float inside the larger one, as they frequently do in Albers' paintings. 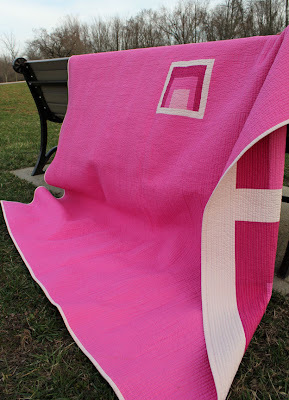 While I was planning the project, I was immediately drawn to using pink fabrics for the quilt. After a long, cold winter, I thought a nice pop of pink would would do me some good. The quilt measures 62'' x 62'', and each of its four large blocks measures just over 24'' square. 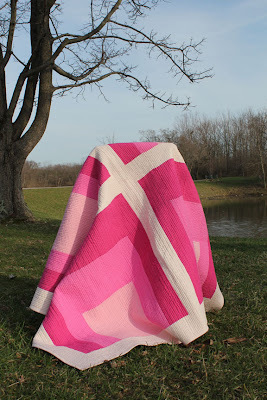 I used four shades of pink cotton: the center of the smallest square is Robert Kaufman's Kona Medium Pink, the middle sized square is Moda's Bella Peony, the largest square is Bella Magenta, and the sashing and binding is Kona Pale Flesh. The backing is Bella Peony with one small pieced square, repeating the design on the front of the quilt. I really think the large scale of the blocks, with the shift in color from lighter to darker pink, gives this quilt a lot of movement. 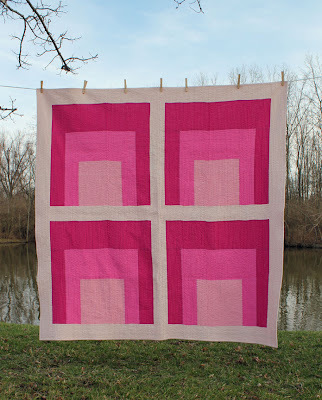 The framing of the blocks with the palest pink provides visual emphasis to each pieced square, but also ties everything together in the form of yet another square. 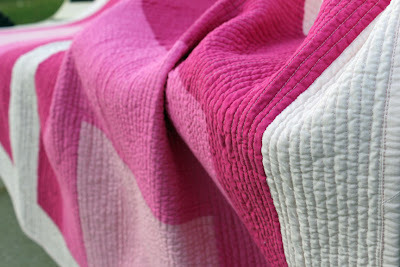 I love the look of heavy quilting and all the texture that it adds to a quilt. I decided to use 1/4'' straight line quilting with light pink thread for this project because I think it really compliments the square motifs of the design. I'm really pleased with how this project turned out and I can't wait to make more versions of this in lots of different colors! I'l be writing up the pattern soon and sharing it with you here on the blog, and I'd love to see your version of Anni too. LOVE it!!! Love the quilt, love the inspiration for it, love the name -- just fabulous! Kudos! Beautiful quilt, I love the little surprise block on the back too! Gorgeous!!!!! Really, this is so lovely! Great job! It's beautiful Heather! I especially love the little block on the back! Wonderful history behind your quilt already! this is GORGEOUS! so amazing, really!! Thanks for sharing the inspiration behind your quilt. It turned out so beautiful! It's gorgeous, Heather! I love the yellow artwork too. It would be gorgeous done in those colors as well. Of course, I am partial to yellow. Good luck with your entry! that is so so pretty! I would love to make one myself and look forward to your pattern, thanks for sharing! Oh please send me your pattern! I have finally gotten my friend excited about quilting with me when I sent her your blog! We will definitely need your help to do it! It's in another colorway, but you can easily swap out colors if you'd prefer. It's basically a square, with logs/tiers around three sides (top, left, and right) to construct each square. Thank you, that's exactly what I wanted to know. This might be the perfect backing for the giant star square quilt I finished yesterday. It'll come together faster than the chevron or stripe patterns I was also considering for the backing. 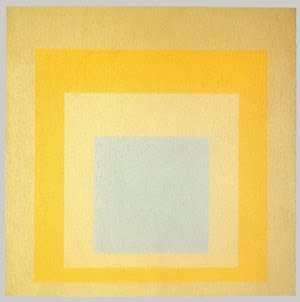 Just fabulous, I'm excited enough to state that I might be doing nothing else but Josef Albers quilts for the future. Oh the possibilities :o). 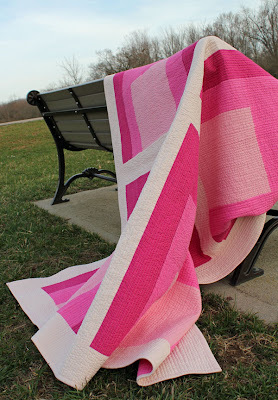 Have you seen this take on a Anni Albers quilt? Đồng hồ Nomos được thiết kế theo diểu dáng cổ điển Bauhaus.Thép chống gỉ 316L được sử dụng để làm vỏ đồng hồ Nomos hoàn toàn không có nicken. Mặt đồng hồ Nomos được lắp kính Saphire và cố định vào vỏ bởi 6 ốc vít cùng tính năng chiệu nước đạt tiêu chí chuẩn 3ATM.